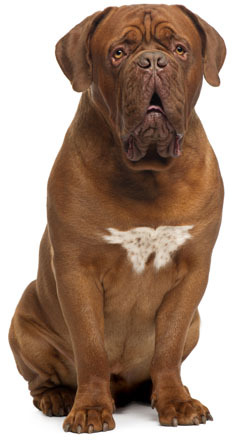 Learn about the temperament and personality of the Dogue de Bordeaux. Discover what he's like to live with, his traits and characteristics and how he generally behaves. And look at lots of Dogue de Bordeaux photos. The Dogue de Bordeaux, or DDB, guards their masters and homes fanatically. They make excellent guard dogs, but do not attack without reason. They are reserved and wary with strangers, so it is important to socialize them when they are young. They will bark when someone new approaches your property, but they are usually not problem barkers. When they are not protecting you from impending harm, they are gentle, even-tempered, patient, and calm. They are incredibly affectionate and will worship you. Owning a DDB is a significant emotional commitment. Because of their size and strength, it is important to start obedience training with a DDB early. While they are intelligent, and learn quickly, they are not terribly obedient. They think for themselves, and can be stubborn and arrogant. It can be difficult to teach your DDB to heel, as he will want to pull you across town. However, DDB's successfully compete in obedience, carting, conformation, weight pulling, water rescue, tracking, and search and rescue. They also make wonderful therapy dogs. Their faces are incredibly expressive and they are known to spend hours gazing into your eyes. They are people dogs and they want to be with their masters 100% of the time. He will expect to sleep in your bed. If you leave your DDB alone, even for a few minutes, you will break his heart. If you leave him alone for several hours, you might not recognize your house when you get back. They are affectionate with children, but these are huge dogs, and a small collision with a DDB can seriously injure a young child. But it takes a lot to make a DDB annoyed or angry, and they are incredibly patient with children. They can be aggressive with other pets -- they often possess a dominant nature. They need moderate daily exercise, and if they don't get it, they will get bored easily. They are versatile and will probably be happy to play at whatever you ask. Each DDB has a unique personality but you can count on two things: they will need your love and attention to be happy; and they drool. A lot. You will find drool on the ceilings. The Dogue de Bordeaux is the hardest to train of all dog breeds. He learns new commands slower than all other breeds. You will need to be extra patient when Training him. The Dogue de Bordeaux sheds a fair amount of hair. You'll find hair stuck to your couch, carpets, clothes and everything else in your home.